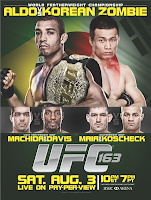 UFC 163: Aldo vs Korean Zombie Fight Pick | MMA Fighting Events Videos Techniques UFC Fight Picks and News. UFC 163 goes down this weekend. The featherweight division is still relatively new to the UFC, but it's becoming one of the most competative divisions. UFC 163 will feature a championship fight between the champion Jose Aldo, and number one contender Chan Sung Jung "The Korean Zombie". Jose Aldo is one of the most athletic MMA fighters today. Chan Sung Jung has no fear an due to this fearless fighting style has earned himself the nickname "The Korean Zombie". This fight has fight of the year possibilities. Let's take a closer look at each fighter, then I'll make my official fight pick. Jose Aldo comes in to this fight as the UFC featherweight champion and sports an impressive overall MMA record of 22-1. His last loss was way back in 2005! His stand up is top notch and his 13 KO/TKO's prove it. He's no slouch on the ground. Aldo is Brazilian Jiu Jitsu black belt. Chan Sun Junk, aka The Korean Zombie is coming into this fight with an overall record of 13-3. He's on a three fight winning streak in the UFC and has finished all three of those fights! Two of those via submission and one via KO. The Korean Zombie is a beast on the ground. Eight of his thirteen wins have come via submission. His relentless, fearless, attacking style have made him a fan favorite, but Aldo is his toughest match up yet. The Korean Zombies will be facing the most athletic and technical fighter yet. Aldo will be able to handle everything the Zombie can throw at him. The Zombie's chance in this fight will be in the later rounds, where Aldo has had trouble. But, can he get it there with enough to finish? I doubt it! Aldo will be able to use his better technical stand up skills and athleticism to win rounds. 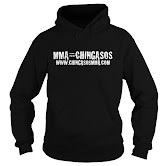 The Zombie will come forward, only to be met my technical punches kicks and takedown defense. Look for this fight to go the distance, the Zombie is tough, but Aldo will pull out a decision. Who's your pick for UFC 163: Aldo vs. Korean Zombie?